It looks interesting; I guess it is best for rather casual games, perhaps even more for G+/Skype games. I might give it a try later, now I have more important (to me) house rules to test. Curious what aspects of this system make it look more suited to casual games. I think it should have similar properties to the original system, just using some different bookkeeping. I would be curious if you see any potential side effects or consequences that I have missed. The issue I’ve always had with these simplified XP systems is that all classes level at the same rate (assuming all play the same games without perishing). Magic user power is balanced by the high XPs required; I had friends who played thieves simply because they leveled quickly. If I ever get my game off the ground, I plan to nerf demihumans with an XP anchor to remove some of the incentive to play them (but if you really, really want to you can). Of course, I could see applying an adjustment (magic users may have to add their level to this value, giving a progression of 0, 2, 4, 7…, or thieves could have a progression of 0, 1, 2, 3, 6, 12…), but this gets rid of some of the simplified math. It adds a bit of friction without too much complication (and the differences tend to go away around high levels, practically speaking, anyways). To be honest though, such balance considerations are not that important to me, so I would probably not bother. In B/X, the only class which is really objectively overpowered is the elf (and that might be better handled by using a multi-class fighter / mage and splitting XP between two classes, which is similar to what the B/X elf is “behind the scenes”). It’s true that sometimes people make decisions about what to play based on perceived ease of levelling (which I believe to be mostly illusionary), but I’m not sure that one can assume that a flat experience progression would bias people towards other classes in the same way. Rather, I think ease of progression would just be less salient overall, and players would base their choice of what to play more on thematic and stylistic preferences, especially in a game with limited synergy and optimization potential. Maybe it’s just that I’m being Congress, adjusting tax policy to direct behavior. Heh. A big part of game design is choice architecture, which is basically the same thing as tax policy. I did something similar to what you have outlined in my home brew campaign. You need to register with the site before you can download anything though. I think I had a copy of this when I was much younger, but I don’t recall many details, and haven’t had a chance to actually read the PDF versions yet. This is the second time you’ve taken one of my ideas and improved upon it. I like it when that happens. And I like this system a great deal better than my Great Monster system. I’ll be using this as a starting point for any future development, I think. I do think there is perhaps still a use for linear levelling in a Zelda-inspired game, especially if the intent is more to defeat the monster lords of dungeon X, Y, and Z rather than the more open-ended traditional D&D endgame. I am betting that this is flexible enough to work – I don’t see it generating a real need for “great mythical monsters” as “drive off or destroy the Bad Dentistry Orc Clan” is a deed as much as “Slay Rageahol the Unreasonably Drunken Giant” is a great monster. I do see it generating quests and goals beyond the “Look a ruin, let’s loot!” style of much ODD play. Yes I’ve wanted to type “Rageahol” all day. I also like previous proposals of task based leveling by class – i.e. A fighter XP at level one is “kill a monster in melee combat” and you need to do several such tasks per level. Yeah, it’s true that defeating a monster is really sort of a special case deed. Highlighting different kinds of deeds is probably useful from an idea generation perspective (or maybe a table of deed types… hmm I think I already have that in Matt Finch’s Tome of Adventure Design… I should really use that book more). How do you see nesting working? example, i have a 4 level tower, if the PC’s explore 3 levels but run off before doing the 4th could i just give them .75? I suppose you could. I mean, it certainly wouldn’t break or anything. I would ask though: what is the deed, treasure, monster, whatever that is associated with the tower? Why are they exploring the tower? Is it to get to a certain section or to recover something? If so, only give XP for that. Is it to create a map? Then the XP point is for a map. Maybe each level has a specific treasure to find or demon to slay? Only you can know what your players will find satisfying, fulfilling, and engaging of course, but I’m perfectly okay with giving out zero XP for a session where PCs don’t succeed in accomplishing any of their objectives. Indeed, the majority of sessions would need to end in 0 XP. Otherwise, players would ascend at a breakneck pace. I suppose once a player reaches level 5 or 6, they may be able to accomplish deeds with greater speed, but at that point even 1xp per session wouldn’t level them very quickly. One problem I see is that all heroes will want to do the easiest deeds possible, since any deed that qualifies will give 1 point. If you’re a 10th level hero and you have a choice between a 20 HD monster and a 12 HD monster, and that’s the only difference between them, you’re gonna go for the 12. And since all heroes will gravitate toward easier deeds, or at least the powerful heroes will complete easy deeds on their way through the neighborhood, there will be no easy deeds left for lowbie heroes. To resolve this I suggest to use sliding-scale deeds / monsters / treasures relative to PC level, up to 4th. Then after that they need to take on bigtime threats. At that point, the PCs will be trying to figure out where the easiest legendary thing is so they can survive it, working their way upward. OR you could have repeatable deeds that qualify if you’re under 4th level but not after. Climbing a specific mountain, a pilgrimage, destroying a lair of intelligent undead, etc. Specifically, each player should have a little checklist of things he can do for sub-4th deeds. These should include stuff like “find and name a permanent magic item”, or “slay a more powerful monster in single combat”. This stuff can get them the 8 XP required for Hero status and get them some local renown. If you’re thirsty for more, drop the checklist of easy stuff and start scrounging the countryside for rumors of legendary stuff. This is kinda like a post I did about how adventurers should perceive the world in scale according to their level of influence. At first you’re low level and you see the world in terms of individual monsters and lairs. Once you get your keep you start to notice political boundaries and power struggles, armies, warfare, etc. At high level you start seeing external-planar threats and opportunities, or spelljamming, or whatever. A 1st level thief sees a town as a place to pick pockets and burgle as much as you can. A 10th level thief sees a town as a cow to be protected and milked slowly. 1d30 wrote: And since all heroes will gravitate toward easier deeds, or at least the powerful heroes will complete easy deeds on their way through the neighborhood, there will be no easy deeds left for lowbie heroes. I’m not sure I follow this. The referee is control of the sandbox, not imaginary heroes. Treasures, monsters, and deeds are not scarce resources. I’m not sure that is a problem. Also, at earlier levels much more care might be needed to accomplish a single task than at later levels, so the dynamics are somewhat self-correcting. I think it applies here, too. Some other problems with lack of granularity are that players who show up for the sessions leading up to completion of a deed would get no XP if they missed the session where the deed got did. Using a regular D&D XP system that PC would get at least some XP along the way. If you start giving fractional or decimal XP you break the good thing this system has going for it. Especially when you recognize that the numerical progression you give is exactly the same as the 1E/2E progression scheme up to 9th. There’s also no way to reward parts of a quest that don’t do anything themselves but lead to a success, unless the final deed is worth more than 1 point, which breaks the good thing again. Why not go further and eliminate XP? Say that PCs have to complete a deed of their level or higher to advance to the next level. In this way you’re effectively giving more XP for high level deeds, if you compare to your table, because a 4th level hero doing a 4th level deed and going up a level from it is effectively gaining 8 deed XP. Or you could make levels more granular and reduce the impact of each new level. For example, maybe let the player give himself one thing per level rather than increasingly powerful abilities across the board. 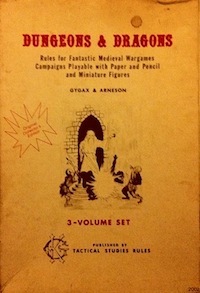 The player could choose between casting one more spell per day, or casting a higher spell level maximum, or getting +1 to hit, or +1d6 HP, or +1 to saves, etc. Level at that point is just a general guideline for how powerful the hero is, not a way to reconstruct his abilities from a template (as you can with, say, a 5th level Fighter in 1E). This also frees you from classes, multiclassing headaches, and gives specific training demands (if you want to be able to cast 2nd level spells, you better find someone who knows how to teach you – not necessarily someone higher level than you). If you reduce what each levels gives you, then you can make every level cost the same to earn. In a traditional GP = XP game, players could also do lots of preliminary work but miss a payoff session (dragon hoard or something like that). The “some XP along the way” might indeed be important psychologically though; I’m not sure. But missing 1 XP in this system does not seem like it would be that problematic. It would only start to matter in the larger picture if the player were to miss lots of sessions, and in that case they would indeed be accomplishing less, no? And thus probably deserving of less XP. 1d30 wrote: The player could choose between casting one more spell per day, or casting a higher spell level maximum, or getting +1 to hit, or +1d6 HP, or +1 to saves, etc. I love thinking about such variants (my Hexagram game uses some similar ideas), but at that point we’re really changing a lot more than just the incentive structure. I was going for a more abstract, less bookkeeping way to level too. Though it was more about pushing players toward doing what we know is fun than giving them agency. The problem of just leveling by time played– “Okay folks, this is our fifth session, you all are second level now.” — is that it de-links leveling from success. And this is dangerous because experience points have been important in defining what D&D is about. If it is about combat prowess you give points for monsters defeated, if its about successful dungeoneering you give xp for gold piece value successfully recovered. But if progression is based on session, what is it all about– attendance, perseverance? Which is why I think criteria like “survived a dicy fight” or “experienced the underworld” don’t really capture the wonderful impartiality of GP = XP. They are both a bit too open ended and a bit too subjective. Like, 3 rooms into the dungeon… is that experiencing the mythic underworld? Whereas recovering a 1000 GP value statue is an objectively measurable treasure wherever it is.